The Canadian Army was small prior to the Great War, but it had a large Militia – equivalent to our Territorials. Canada’s response in 1914 to Britain declaring war on Germany was immediate and a decision was made to create a Canadian Expeditionary Force (CEF) with many of the original units having a nucleus of men from the pre-war militia. Within weeks a Canadian Division was ready for overseas service and it’s units dispatched to England where they assembled for eventual service in France and Flanders. Of the men who served in this original CEF, some 70% were born in the United Kingdom. This group of CEF originals are from the 1st Canadian Brigade Canadian Engineers, part of the 1st Canadian Division. 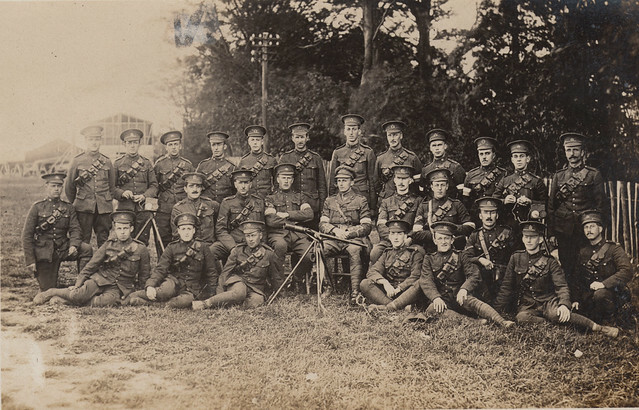 They are photographed in camp on Salisbury Plain where the CEF was in final training to be sent overseas. Within a few months these men were in the trenches in Flanders and in April 1915 they would be heavily involved in the Second Battle of Ypres, when poison gas was used for the first time. This entry was posted on 01/10/2012 by sommecourt. It was filed under CEF, Flanders, France, Great War, Western Front, WW1 and was tagged with 1914, 1915, Canadian Engineers, Canadian Expeditionary Force, CEF, WW1.